$1,000 NATIONAL ADULT SPELLING BEE | LONG BEACH, CALIF. The $1,000 National Adult Spelling Bee was started by Justin Rudd in Long Beach, Calif., in 2006. Rudd also hosts the $1,000 National Kids Spelling Bee that began in 2002. Both bees are held annually in Long Beach. I have always been a fan of competition. As a student I participated in lots of contests -- YMCA sports; art, drama, choral & instrumental competitions; geography & science projects; spelling bees and more. When I first moved to California a few years ago, I auditioned for singing/acting jobs and was fortunate to work in many movies, TV shows and several of Disney's special events around the country. My bulldog and I competed on a TV show, "You Lie Like a Dog" on Animal Planet where we won money for local animal charities. Spelling is important to me. In my current profession as an event planner, I have to do a lot of writing and reviewing of press releases. Good spelling and grammar are mandatory. When I send and receive e-mail messages, I like to make a good impression by sending documents that have perfect spelling, grammar and punctuation. I don't like to rely on "Spell-Check." I want students and adults to learn excellent spelling habits. Hence, the creation of this adult spelling bee. The contest is open to the best spellers in high school and older, ages 18+. Hope to see you at the Bee! RIGHT NOW, while the need is in your mind, won't you please donate? We receive no government monies, and depend entirely on people like you. WE HOPE YOU share our love for animals, kids and the environment, and our wish is that you'll consider a gift of $25, $50, $100 or another amount so that we can continue to bring you and our community fun events and meaningful projects. CHECKS to Spelling Bee, Attn. Justin Rudd, 275 St. Joseph Ave., Long Beach, CA 90803. I AM A FIRM believer in the collective power of individuals joined in a spirit of goodwill and generous giving to bring about the success of an organization. That's why we need you to get involved. THE MAIN PURPOSE of the Community Action Team (CAT) is to promote social well-being among the general public. As a 501c3 nonprofit corporation governed by a board of directors, contributions to CAT are tax deductible and are used to help produce quality events within our community that benefit children, animals, and the environment. We will announce the date of the 2020 Bee in January 2020. 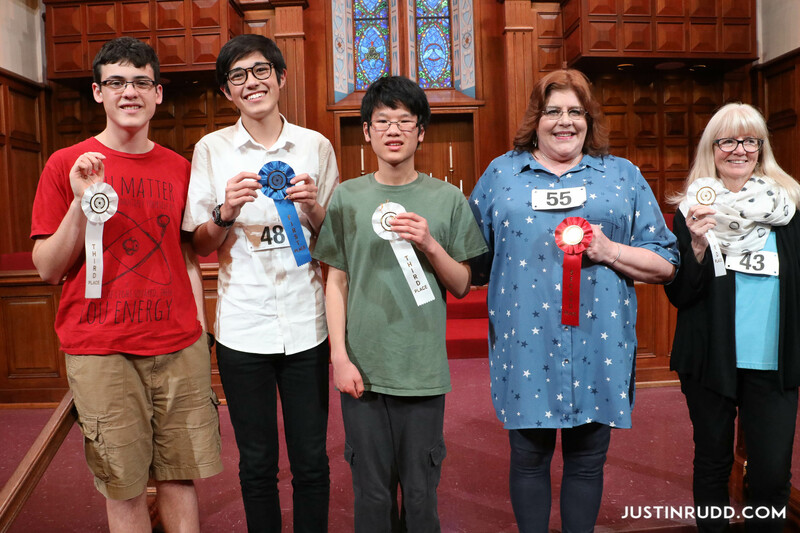 Sixteen-year-old Cooper Komatsu (second from left) of Los Angeles won the blue ribbon and $1,000 at the 2019 National Adult Spelling Bee. TWENTY-THREE spellers from as far as Texas competed in the 14th annual National Adult Spelling Bee in Long Beach, California, on Sunday, March 10, 2019. The bee with a $1,000 prize is hosted by Justin Rudd's nonprofit Community Action Team (CAT). The winner keeps $500 of the cash and agrees to donate the other $500 to charity. At the end of the two-hour, 25-round bee, it was 16-year-old Cooper Komatsu of Los Angeles who won the blue ribbon and cash. He is in the 11th grade at Culver City High School. He will be donating half of his winnings to Wikipedia. He correctly spelled "cappelletti" and "zoysia" in the final two rounds to win. 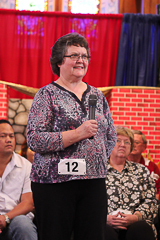 Anne Wright of Long Beach, California, was second place after misspelling "mavourneen." There was a three-way tie for third place that included 14-year-old Aren Wang, Lindsey Kiser, and 16-year-old Jem Burch. They misspelled "hemidemisemiquaver", "gardyloo" and "fescennine" respectively in round 23. Other words in final rounds included: verisimilitude, glasnost, tetracycline, funicular, loge, osprey, jonquil, tetrad, palatinate, calumny, malefic, isthmus, avoirdupois, kewpie, scintillating, alopecia, concomitant, chimera, milieu, sidereal, panoply, inveigh, surveillance, trichinosis, and ersatz. Sunday, March 10, 2019; 4:30 p.m.
Any adult, at least (new age limit) 14 years old, who is a resident or student in the United States. Seniors welcome. The winner will receive $500 and his/her favorite nonprofit organization, school, or place of worship will receive $500. 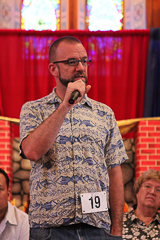 The Bee is hosted annually by Justin Rudd and his nonprofit Community Action Team (CAT) and is held at the Bay Shore Church in Long Beach, Calif.
Kate Karp is the pronouncer each year. She was the champion in the Bee's first year. Judges include Willa Heart and Sharon Sueki. 2006 Kate Karp; Long Beach, Calif.
2007 Hal Prince; Palo Alto, Calif.
2008 Janice Davis; Orange, Calif.
2009 Michael Petrina; Arlington, Va.
2010 Anne Wright; Long Beach, Calif.
2011 Janice Davis; Orange, Calif.
2012 Michael Petrina; Arlington, Va.
2013 Jim Sherry; Troy, Ala.
2014 Bernetta Gresko; Long Beach, Calif.
2015 Tony Johnson; Newnan, Ga.
2016 William Thill, Los Angeles, Calif.
2017 Kiri Wagstaff, Monrovia, Calif.
2018 Anne Johanson-Wright, Long Beach, Calif.
To get on the Nat'l Kids Spelling Bee and/or Nat'l Adult Spelling Bee e-News e-mail lists, CLICK HERE and input your e-mail address. 2018 WINNERS: After more than three hours and 32 rounds, it was Long Beach, California's Anne T. Johanson-Wright who won the 13th annual National Adult Spelling Bee at Bay Shore Church in Long Beach on Sunday, March 11. Some words she correctly spelled in the bee's later rounds included azoic in round 32, ess in round 31 and mucilaginous in round 30. She is donating half of her $1,000 prize money to School on Wheels, Inc. Anne also won the bee in 2010. Third place went to Jacob Williamson from Washington, D.C. It was round 27 when he misspelled fewtrils. Other words he got right in final rounds included ziggurat, volplane, and pityriasis. Noachian, chartreuse, ziggurat, orrery, balletomane, Pygmalion, volplane, smaragdine, Apollyon, fibrinogen, pityriasis, eisegesis, roué, mihrab, fewtrils, gurnard, galah, Aceldama, xeriscape, calyx, oakum, mucilaginous, burin, ess, azoic. Spellers came from Washington, D.C., New Jersey, Texas, Oregon, Nevada and California. Congratulations to the 2017 National Adult Spelling Bee champion, Kiri Wagstaff of Monrovia, Calif. She plans to give half of her $1,000 winnings to the Monrovia Public Library. She correctly spelled "accrete" in round 16 to win the bee. In rounds leading up to the final round, she also correctly spelled "cathect", "glissade" and "dermatophyte." Accrete means to "grow by accumulation or coalescence." Second place went to Anne Wright of Long Beach, Calif. Anne was the Bee's champion in 2010. In today's bee, she misspelled "spilth" in round 15, but had correctly spelled "morello", "pleonasm" and "gurry" in some of the earlier rounds. Third place went to last year's champion, William Thill of West Hollywood, Calif. Today, he got out on "palinode" in round 13. Other words he got right included "hauberk", "flagon" and "foulard." The National Adult Spelling Bee is held each March in Long Beach, Calif., and is hosted by Justin Rudd and his nonprofit Community Action Team (CAT). They also host the National Kids Spelling Bee on the same day. More than 60 spellers came to the March 5, 2017, bees from as far as Atlanta and San Antonio. William Thill of Los Angeles correctly spelled "fulguration" and "parthenogenesis" to win the $1,000 prize at the 11th annual National Adult Spelling Bee in Long Beach, Calif. on Sunday, March 6, 2016. A few of the other words he correctly spelled in later rounds of the bee included "patzer", "pomaceous", "noetic", and "foxing." This was Thill's first time in the bee, and he works as a mathematics teacher at Harvard-Westlake School. He is donating half of his winnings to the Thrive Tribe Foundation to help "educate and empower HIV negative and positive people by applying today's science and knowledge to end HIV." WINNING WORD MEANINGS: Fulguration is "the act or process of flashing like lightning." Parthenogenesis means "reproduction by development of an unfertilized usually female gamete that occurs especially among lower plants and invertebrate animals." Second place went to Vicki Craig of San Antonio, Texas. She was eliminated in Round 18 of the approx. 2 ½ hour bee by incorrectly spelling "ganache." Earlier in the bee she correctly spelled "cabotage", "prolix", "facetious", and "marplot." This was Craig's second time to get second place in this bee. Third place was a three-way tie between Mitch Powell of Santa Ana, Calif., Michael Chaskes of Los Angeles, and Anne Wright of Long Beach, Calif. In Round 16 they misspelled "prorogue", "theriac" and "cadastral," respectively. Registrants in the bee were from five states. The bee is hosted annually by Justin Rudd and his nonprofit Community Action Team (CAT) at Bay Shore Church in Belmont Shore. Kate Karp is the pronouncer. 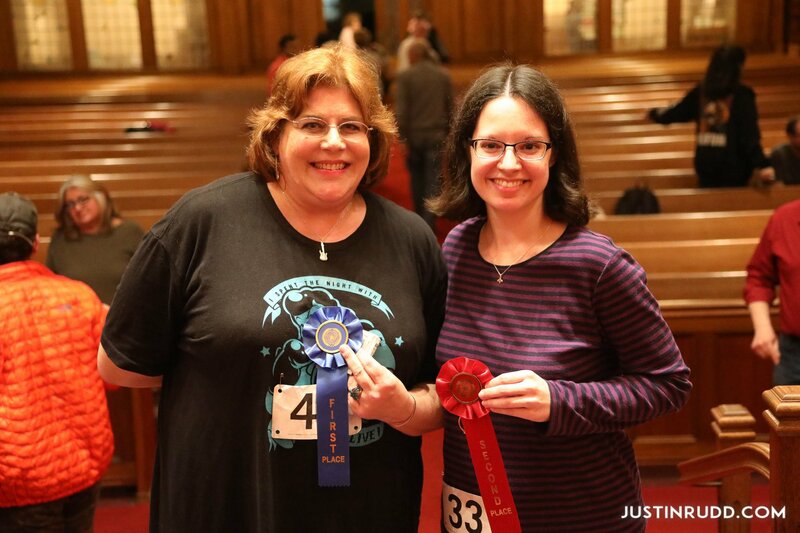 Judges included Willa Heart, Sharon Sueki, and Elizabeth Schirmer. The prize money comes from CAT's Long Beach Turkey Trot 5K/10K. THE WINNER of the 10th annual National Adult Spelling Bee was Tony Johnson of Newnan, Georgia. After 2 hours and 20 minutes of words on Sunday, March 1, 2015, he correctly spelled “curtilage” in Round 24 and “chondroitin" in Round 25 to win. He is donating $500 of his $1,000 winnings to Fisher House Foundation (www.fisherhouse.org). Second place was Vicki Craig of San Antonio, Texas. She misspelled "serval" in Round 24. Third place was Jim Sherry of Troy, Alabama. Jim misspelled "subfusc" in Round 22. Fourth place went to Jan Stanakis of Huntington Beach, Calif. Fifth place was a tie between Dawn Catlett of Ventura, Calif. and Anne Wright of Long Beach, Calif. THE WINNER of the 9th-annual National Adult Spelling Bee﻿ was Bernetta Gresko, Long Beach, Calif. She lives in the Belmont Shore neighborhood where the Bee took place.﻿ She is donating $500 of her $1,000 winnings to National Organization for Rare Disorders. After 2 hours and 10 minutes of words, she correctly spelled “phalanx” in Round 16 and “contumacious” in Round 17 to win. SECOND PLACE WAS A TIE for Janice Davis, Garden Grove, Calif., and Anne Wright, Long Beach, Calif. Both are previous winners of this Bee. Davis and Wright got out in Round 16 after misspelling “divagate” and “prevenient,” respectively. THIRD PLACE went to Lakshmi Gandhasri of San Jose, Calif. She misspelled "costive" in Round 13. Adult spellers came as far as Texas and Virginia. The guest pronouncer for Round 1 was Tim Grobaty﻿, columnist at the Long Beach Press-Telegram. The Bee is hosted annually by Justin Rudd and his nonprofit Community Action Team. 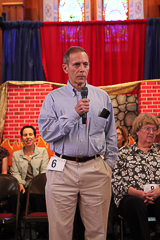 Congrats to the 2013 National Adult Spelling Bee winner Jim Sherry from Troy, Alabama. Jim won the $1,000 prize in Round 27 by spelling "quincunx." In the later rounds of the Bee, he also correctly spelled "festinate", “maquette”, kludge” and “moiety.” It was his fourth time traveling to compete in the Bee. He teaches French at Troy University. The charity that he was playing for is Troy University Circle K, and they will receive his prize money. This was the 8th-annual Bee for adults. Last year’s winner was from Virginia. Second place went to Bernetta Gresko of Long Beach, Calif., after misspelling "tourbillion" in Round 26. She is a retired school teacher. Third place went to Dave Lieberman of Anaheim, Calif. He misspelled "etesian" in Round 14. Fourth place was Thu-Hương Nguyễn of Long Beach, Calif. She misspelled "Cyrillic" in Round 11. Fifth place was a three-way tie between Sheila Patel, San Francisco; Pamela Cisneros, Garden Grove, Calif.; and Janice Davis, Garden Grove, Calif.
W-I-N-N-E-R! Congrats to all the great 2012 National Adult Spelling Bee spellers who competed on April 22. Michael Petrina, far left, of Arlington, Va., won $1,000 by correctly spelling "dossier" and "flageolet." Second place was Patricia Knatz, second from left, from Studio City, Calif., after misspelling "limen" in Round 16 of the approx. 2-hour bee. Third place was a tie for Janice Davis, second from right, of Garden Grove, Calif. and Lindsay Harrison, far right, of Chico, Calif. THERE WERE MORE than 30 contestants from across the country that registered for the 7th annual National Adult Spelling Bee that took place in Long Beach, Calif., on Sunday, April 22, 2012. Spellers traveled from as far as Virginia, Alabama and Georgia for this Bee that has a $1,000 prize. The prize money comes from the Long Beach Turkey Trot. MICHAEL PETRINA of Arlington, Virginia, took home the $1,000 prize at the end of the 17th Round, and is donating half of that to the Alzheimer's Association. He also won this Bee for the first time in 2009. This year's winning words for Michael were dossier and flageolet. 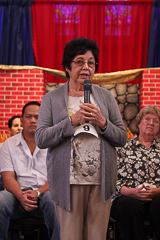 THE SECOND PLACE speller was Patricia Knatz from Studio City, Calif. She misspelled limen in round 16. Some of the words she correctly spelled included rupee, glyptic, lamprey and diurnal. THIRD PLACE was a tie. The two spellers were Janice Davis of Garden Grove, Calif., and 17-year-old Lindsay Harrison of Chico, Calif. They both got out in Round 14 after incorrectly spelling architrave and golem, respectively.. THE 4TH-PLACE speller was Kiri Wagstaff of Monrovia, Calif. She got out on asceticism in Round 13. FIFTH PLACE was a four-way tie between Thu-Huong Nguyen of Long Beach, Calif.; Nicholas Kuefler of Decatur, Ga.; Jim Sherry of Troy, Ala.; and Anne Wright of Long Beach, Calif. Words they misspelled were lachrymose, jehu, kachina and levigate, respectively, in Round 11. MORE THAN 230 WORDS were used in the Bee. The National Adult Spelling Bee was created and is sponsored by Justin Rudd and his nonprofit 501c3 Community Action Team (CAT). They also host the annual National Kids Spelling Bee each March in Long Beach. SOME CORRECTLY SPELLED words included cozen, kundalini, skein, and esemplastic. included sinecure, gubernatorial, longanimity, millennial, dalliance and egalitarian. To get an e-mail reminder about the next National Adult Spelling Bee CLICK HERE to get on bee organizer Justin Rudd's e-mail list. GOOD SPELLER? To get an e-mail reminder about the next National Adult Spelling Bee, CLICK HERE to get on bee organizer Justin Rudd's e-mail list. This online spelling bee by The Free Dictionary. Janice Davis, Garden Grove, Calif. Correctly spelled decoupage and isinglass. She won $1,000 after 37 rounds! She'll be donating $500 of that to her favorite charity, Set Free Christian Ministries in Orange, Calif.
David Riddle, Pacific Grove, Calif. Misspelled axolotl. Michael Petrina, Arlington, VA. Misspelled aikido. Christy Ewing, Long Beach, Calif. Misspelled tilde. Vicki Paris Goodman, Long Beach, Calif. Misspelled burgher. SEE THE COMPLETE 293-WORD LIST IN THE RIGHT COLUMN OF THIS PAGE. PLENTY, ESPECIALLY when it's the rigors of a traditional spelling bee and one of the participants has the opportunity to walk home with a grand title! Words like extraterrestrial, meringue, fiery and phylum must be spelled and spelled correctly under the watchful eyes and ears of judges. IF THAT IS NOT CHALLENGING enough for an adult, it must be done while their peers and families, who are also nervously awaiting their opportunity to shine, look on. The National Adult Spelling Bee is designed to help adults and students in high school and college improve their spelling, increase their vocabulary, and develop correct English usage. This contest is sure to have some nail-biting, breath-bating competitors. ADULTS ARE ELIMINATED from the competition after misspelling one word. The rules are fashioned after the National Spelling Bee -- a contest for students up to and including grade eight. 1. Any adult, at least (new starting age limit) 14 years old, who is a resident or student in the United States, may enter and participate. 3. The entry fee is nonrefundable and nontransferable. 4. The difficulty for words in the competition will start at a middle school level. 5. The judges are in complete control of the competition, and their decision shall be final on all questions. All rules are subject to modification by the judges and/or the event organizer, Justin Rudd. 6. There is not an official study booklet for this competition. 7. All participants are expected to be signed-in at the event location no later than 30 minutes prior to the announced starting time of the contest. 9. Participants may draw numbers to see who starts first (which presents an element of risk as elimination occurs in order). Or, organizers may pre-assign the numbers. 10. The role of the pronouncer is (1) to correctly pronounce the word and (2) to give a sentence, definition, and other information about the word at the speller's request. 11. The role of the judge(s) is to determine whether the contestant has spelled the word correctly. 12. The role of the speller is (1) to gather as much information as possible to help spell the word correctly and (2) to spell the word correctly. 13. In competition, after the pronouncer gives the speller a word, the speller is encouraged to pronounce the word before spelling it and after spelling it. The judges may not disqualify a speller for failing to pronounce the word either before or after spelling it. 14. The speller may ask the pronouncer to say the word again, define it, use it in a sentence, provide the part of speech, and/or provide the language of origin. The pronouncer shall grant all such requests until the judges agree that the word has been made reasonably clear to the speller. The pronouncer and judges will not entertain root word questions. 15. The judges may disqualify any speller who ignores a request to start spelling. 16. The judges may not disqualify a speller for asking a question. 17. Having started to spell a word, a speller may stop and start over, retracing the spelling from the beginning. In retracing, however, there can be no change of letters or their sequence from those first pronounced. If letters or their sequence is changed in the respelling, the speller will be eliminated. 18. The competition shall be conducted in rounds. Each speller remaining in the spelling bee at the start of a round shall spell one word in the round. Upon missing the spelling of a word, a speller immediately drops out of the competition. The next word on the pronouncer's list is given to the next speller. 19. Under no circumstance is any speller asked to correct the misspelling of another speller. 20. If none of the spellers remaining in the spelling bee at the start of a round spells a word correctly during that round, all shall remain in the competition with the spellers spelling in the original order. 21. All spellers eliminated in the same round will be tied for the same place. 22. During the final rounds of the competition, the judges may choose to allow participants the option of writing the word down on paper before being required to spell it orally. 23. If only one of the spellers remaining in the competition at the start of a round spells a word correctly during that round, a new round shall begin and the speller shall be given an opportunity to spell the next word on the list. If the speller succeeds in correctly spelling the new word, the speller shall be declared the champion. Otherwise (that is, if the speller does not succeed in correctly spelling the new word), all the spellers remaining in the competition at the start of the previous round shall remain in the competition. A new round will begin, with these spellers spelling in the original order. The champion is not the champion until he or she has spelled correctly two more words than the speller or spellers placing second have spelled. These two words will be spelled consecutively only if the champion is the last speller in a round. It is possible in two instances to have a round in which only one word is spelled. The first instance of a one-word round is the correct spelling of the final championship word. The second instance of a one-word round is the misspelling of what could have been the final championship word. 24. Any question relating to the spelling of a word should be referred to the designated official immediately, that is, before the speller affected would have received his/her next word had he/she stayed in the contest. 25. The judges will not entertain appeals from individuals seeking to dislodge another speller from the competition. The deadline for filing an appeal is before the speller affected would have received his/her next word had he/she stayed in the competition. No appeal will be entertained after that word has been given to another speller. 27. If a word has one or more homonyms, the pronouncer will indicate which word is to be spelled. If the listed word is not properly identified, either by defining it or distinguishing the homonyms, any correct spelling of any homonym of the word will be accepted. 28. The speller shall not be disqualified for failing to note that a word is capitalized (noted as "cap," "usu cap," "often cap," or "sometimes cap." 29. The dictionary provided by the judges shall serve as the final authority for the spelling of words. If more than one spelling is listed for a word, any of these spellings will be accepted as correct if the word either matches the pronunciation and definition provided by the pronouncer or if it is clearly identified as being a standard variant of the word that the speller has been asked to spell. Spellings at other locations having archaic, obsolete, or regional labels (such as North, Midland, Irish, British) that are different from those at the main entry will not be accepted as correct. WHAT ELSE DOES C.A.T. DO? Details about the Community Action Team C.A.T. and their more than 30 annual Long Beach events and projects are at www.JustinRudd.com.